Ah, death metal! It’s been a bit since I reviewed something from your hallowed legions! We didn’t seem like the perfect match when we first met, but I was only a child then. In later years, while I still see your flaws, ours is a relationship to be cherished for all time. Well, mostly. When the collision between DM and pop rears its putrid, candy-coated visage, my finger starts twitching instantly, drawn inexorably towards the button labelled ‘rage quit’. It’s not a genre which was ever intended for conformity, and when it’s treated as such, it really gets my goat. And puts it in a Hot Topic shirt. 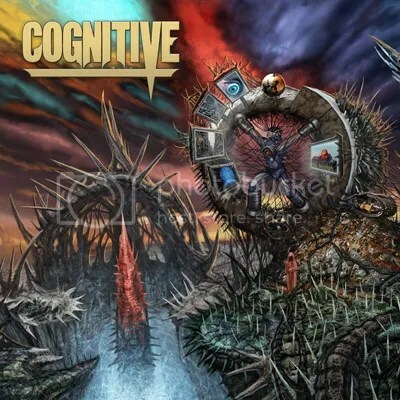 The first few seconds of Cognitive’s self-titled album momentarily fill me with the fear that this is just going to be another cookie-cutter, death-by-numbers botch job, but it doesn’t take them long to smash that preconception square in the face. There’s much referencing to the DM riff library of old, true, but it is done with such a casual flick of the wrist, that it translates as a successful exercise in tribute, and not a mere rip-off as is unfortunately common these days. They truly embody a confident and individual character in a genre that can, at times, be stale and lack the fangs and claws of the generation before. From the shades of No Tolerance… era Man Must Die, to the hints of Spires smeared throughout, this is utterly compelling. There is always something to grab the attention, albeit it to throttle it violently before dumping it, sprawled on the deck, only to march onto the next willing victim. Broken up by the mid-point acoustic track Oceanic Erosion, which would sound equally at home on a folk record, the pasting begins anew with the epic introduction to Willingness Of The Weak, before returning to the bludgeoning death-thrash of Imbuing Of Wrath. I’m falling for this album more with each consecutive listen. This is the sound of a band who are completely unafraid to push boundaries, which shunts them right to the top end of my list; heavy on the one hand, but with sensibilities of how to really write music on the other. The guitar solo in Regurgitated Existence is a particularly effective display of the potential for emotional beauty in extreme noise. Shifting shape, texture and drive at various points, this album is well written, expertly performed and effectively arranged; a prime example of how it should be done! By rights, Cognitive could be standing shoulder to shoulder with some of the greats of death metal in the not too distant future. If you pine for the days when brutality relied on writing a riff rather than avoiding them at all costs, you are going to love this!!! This entry was posted on 4th July 2014 at 7:59 pm and is filed under CD, Metal with tags Cognitive, Death Metal, Pathologically Explicit Recordings. You can follow any responses to this entry through the RSS 2.0 feed. You can leave a response, or trackback from your own site.